On November 17th, we will be holding our Sixth Abilities Tip-Off. This annual event marked the beginning of our organization, and was a competition between the University of Scranton and Misericordia University. As I AM has continued to grow we have happily expanded the Abilities Tip-Off to include the University of Scranton, Misericordia, TCMC, Wilkes University, Marywood University, and Lackawanna College in the past with the hopes of continuing to grow and reach as many area universities as possible moving forward. 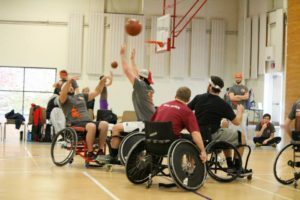 For those who aren’t aware the Abilities Tip-Off is a wheelchair basketball tournament designed to give students in health related fields a first hand glimpse at wheelchair sports. This year’s event will once again be held at the University of Scranton. It will begin at 9:00 a.m. and run until we have reached a winner in this double elimination tournament. Teams will compete in a three on three format with games lasting approximately 25 minutes each. Schedules will be presented prior to the event. Teams shall consist of five to eight players and are asked to have a minimum of one female and one male on the court at all times. The winning team will receive $100 in gift cards to Bar Louie, and will have their team name engraved on the Tip-Off trophy to be displayed at their school for the year. Additional activities, games, and prizes will also be held at the event. See additional rules below. Early Registration Deadline: October 24th at 11:00 p.m. The entry fee is $10 per person and will include a tee-shirt and food, as well as three tickets for the $50 student only raffle. Registration Deadline: Halloween, October 31st at 11:00 p.m. The entry fee is $15 per person and will include a tee-shirt and food, as well as one ticket for the $50 student only raffle. For more information or to ask additional questions, please contact Joseph at joseph.e.salva@gmail.com, or 570-561-6139.